All-American teenager Archie goes toe to toe with an all-star cinematic killing machine in Predator. The first issue in the brand new series adds a touch of horror to the Archie formula without subtracting the lighthearted fun of Archie’s personal dilemma of Betty vs. Veronica. 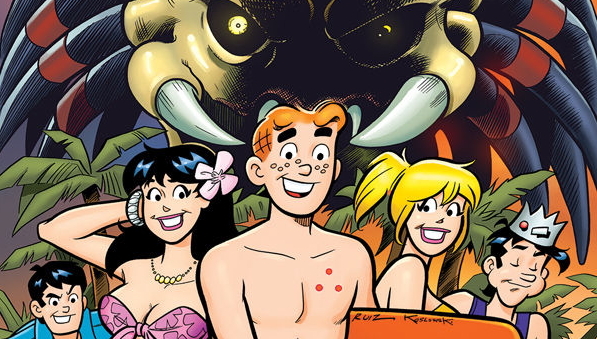 “Archie vs. Predator” finds the Riverdale High School gang on spring break heading to the Los Perdidos resort in the Caribbean—when a gorgeous shooting star comes across the sky, the gang is in awe and all wish upon a star, little do they know they are wishing upon an agent of death. When it comes to character, if you have picked up any Archie comic ever you know exactly what you are getting from this book. If you want to nitpick, you can complain about the lack of Predator, however, it’s very hard to develop a dreadlocked alien whose only purpose is to kill. It actually plays much better that we don’t get too much of the horror icon, it leaves little breadcrumbs that make you very excited for what is to come. This first issue, like many first issues, establishes the tone. Although the first issue does not give us too much Predator it just gives just enough, like the opening of an ’80s slasher flick, a bunch of carefree teenagers are unknowingly about the be the victims of some gruesome deaths. Writer Alex da Campi does a great job of seamlessly blending the worlds of Archie and Predator by staying true to the tone of Archie comics while implementing some horror troupes that don’t seem out of place. The real pleasure lies in the fact that the book has a self-awareness that’ll make Phil Lord and Chris Miller proud. It is this self-awareness that makes what seems like a match made in a Portland. Campi’s script plus Fernando Ruiz’ pencils, Rich Koslowski’s ink, splashed with Jason Millet’s colors is a four horseman-esque team that makes the book click and will have you yearning for the next issue to see whose spine Predator collects.